Supported by the California Postsecondary Education Commission, this program is affiliated with the Homeland Security Center for Risk and Economic Analysis of Terrorism Events (CREATE), and the Center for Emerging Materials and Solid State Lighting with the goal of improving middle school STEM achievement. This program is located in Paramount Unified School District and is a middle school teacher training and middle school curricular intervention program focused both on STEM education and science literacy. Supported by the National Science Foundation and located in the Inner City Education Foundation (ICEF) Charter School organization in Los Angeles, this project aims at leading middle and high school students to engineering by providing them with innovative engineering educational materials, pedagogy and curriculum that have dramatically improved the content knowledge and retention of students in engineering at USC. The focus of the academy is environmentally and technology relevant STEM secondary education and teacher professional development with an emphasis on increasing students’ science literacy. Summer High School Intensive in Next-Generation Engineering (SHINE) Apply now! Designed for Los Angeles-area high school students, SHINE is a competitive and unique seven-week opportunity to participate in hands-on engineering laboratory research and scientific literature reviews focused on real-world problems. Close mentorship comes from USC Viterbi faculty and staff, graduate student researchers, plus visiting national scholars. Fee based program. The USC Viterbi Robotics & Coding Academy for 5th graders at 32nd St./USC Magnet School, Dr. Theodore T. Alexander Jr. Science Center School, and John W. Mack Elementary School helps develop students’ technology and engineering skills through hands-on learning with robots, mentored by USC students. This free, after-school program is possible thanks to the generous support of the USC Good Neighbors Campaign, an employee giving program that supports university-community partnerships; it is organized by USC Viterbi School of Engineering’s VAST (Viterbi Adopt-a-School, Adopt-a-Teacher). CS@SC Summer Camps provides a one-week camp in computer science and engineering for USC Family of Schools students in 4ththrough 9th grade interested. This program is free for all students. The USC Science, Technology And Research (STAR) program, founded and directed by Dr. Roberta Diaz Brinton, is a 25-year collaborative science education program through a long-standing partnership between the University of Southern California (USC) and Francisco Bravo Medical Magnet High School. USC STAR scholars learn inquiry-based science and math by conducting research alongside world-renowned scientists at USC. STAR scholars compete in the annual USC-Bravo Science Fair and present their research projects at the annual STAR Symposium. STAR scholars have conducted research in Neuroscience, Neurodegenerative Diseases, Stem Cell Biology & Regenerative Medicine, Cancer Biology, and Global Health. Robotics and Autonomous Systems Center is an interdisciplinary organized research unit (ORU) in the USC Viterbi School of Engineering that focuses on the science and technology of effective, robust, and scalable robotic systems, with broad and far-reaching applications. The Family Science program is an afterschool and evening program supported by Iridescent (a non-profit community science organization). In this program, parents and students work together in engaging science activities intended to increase students’ interest in science education. The 4-Week college immersion program offers high school students university experience in an engineering subject area of their choice. Courses are interactive, engaging and challenging, allowing students to explore new areas of study or build on their high school coursework, including: Introduction to Video Game Design, 3D Design and Prototyping, and Discover Engineering. Students benefit from academic instruction and support from faculty and staff while earning 3-units of USC elective credit. As a result of Chevron’s continual commitment in education and STEM, we will be selecting 20 outstanding high school students (rising juniors and rising seniors are eligible to apply) from across the U.S. to attend the Chevron sponsored summer educational camp, “Frontiers of Energy Resources”, hosted at the University of Southern California and scheduled for July 10 – 15, 2016. Selected students are responsible for their own transportation to USC. While on campus, room and board will be covered by Chevron. This competitive summer program, in its 8th year, will introduce students to the science foundation of energy resources. They will also learn about the career possibilities in energy resources fields. Please advise your outstanding students to apply for this great educational experience. I’ve attached a flyer to post and distribute. We also welcome separate applications from high school science teachers who can attend this weeklong event as observers and return with resources and tools to enrich their educational efforts at their schools. Applicants should visit http://cisoft.usc.edu/uscchevron-summercamp/ to access the online application and download the teacher recommendation form. The application deadline is April 8, 2016. For further information please contact Juli Legat atcisoft@vsoe.usc.edu. The Viterbi School of Engineering supports various STEM teacher academies in which teachers join USC Viterbi researchers in collaborative engineering research and related curriculum development in the form of teacher professional development. Currently several of USC’s national research centers are participants as collaborators in these academies: Homeland Security Center for Risk and Economic Analysis of Terrorism Events (CREATE), the Optimizing Participation through Technology Rehabilitation Engineering Research Center (OPTT RERC), and the Center for Emerging Materials and Solid State Lighting. Graduate and Undergraduate students in Viterbi School of Engineering are engaged in diverse service learning activities. Various service-learning projects are available when engineering undergraduate students enroll in courses including Engineering (Writing) 340 and the Freshman Engineering Academy. In their upper division writing course, Engineering 340, students create articles and various projects that can be used by teachers interested in infusing engineering research in their K-12 curriculum. In the Engineering Freshman Academy courses, students can participate in USC’s Joint Education Project (JEP) and tutor K-12 students in STEM education. Body Engineering Los Angeles (BELA, PI: Krishna Nayak, co-PIs: Andrea Hodge, Maja Matarić, Gisele Ragusa) is an NSF GK-12 program at the Viterbi School that involves and prepares several of our best Ph.D. students to become science, technology, engineering and mathematics (STEM) leaders of tomorrow through a fellowship that incorporates extensive training and K-12 classroom experience. The program’s research theme is body engineering, and emphasizes the concept that the human body is a machine that can be studied, experimented upon, analyzed, and augmented. This theme provides an attractive and engaging vehicle for introducing STEM concepts and university research to the K-12 classroom and leverages the overall strength of the Viterbi School, several university research initiatives at the interface between engineering and biology, physiology, and health, and a large group of committed faculty. Research topics that will be translated to the classroom include: non-invasive sensing and imaging, speech articulation, hand articulation, neuromuscular control, cardiovascular mechanics, nutrition and metabolism, biological and bio-compatible materials, vision, object recognition, and human-machine interaction. USC CSMARTS in LA: Computer Science Mentorship for the Advancement of Teachers and Students in Los Angeles The CSMARTS program, funded by Google, includes a workshop focused on participatory design in which we invite teachers to fully participate in learning and applying fundamental computational thinking (CT) concepts, identify CT concepts within their own classes, and work to develop curriculum within the context of their course content. This curriculum is co-constructed with the USC team, with attention to the specific needs of each teacher participant. The content of the workshops are focused on computational thinking, computer programming, and introduction to robotics. The workshop is one week long with a hybrid school site and Web-based professional development follow-up. The face-to-face component of the workshop is held in the Robotics Lab in the Computer Science Department at USC’s Viterbi School of Engineering. Mornings of the workshop (9-noon) are focused computational thinking exploration and applied activity practice, computer science content understanding in applied contexts, curriculum development, and hands on lessons development. Foci are on societally relevant applications of this content with community needs at the core. Afternoons of the workshop (1-3pm) are focused on designing, programming, and building robots using the robotics kits that the teachers take back to their classrooms and robotics teams. The content of the workshop is aligned with computational thinking, community application of such thinking, and using programming of socially responsible robotics projects as a tool. On the final day of the workshop, the teachers invite their respective school site administrators and/or principals for a nuts-and-bolts workshop on how to effectively develop and implement a competitive robotics team at their school sites. The NSF-sponsored Engineering Medical Therapeutic Technologies Research Experience for Teachers (EMT2-RET) Site Program (PI: Mark Humayun, Co-PI: Joseph Cocozza) supports the involvement of high school and community college STEM teachers in engineering and computer science research focused on medical therapeutic technologies conducted in Viterbi School of Engineering (VSoE) and Biomimetic MicroElectronic Systems Engineering Research (BMES ERC) laboratories at the University of Southern California. Through participation in cutting-edge research at USC, teachers gain advanced knowledge of engineering and computer sciences. RET teachers collaborate on projects under the mentorship of world-renowned scientists and engineers. The coordinated efforts of multidisciplinary research groups offer RET teachers the opportunity to work in laboratories that range from basic science to systems engineering. Additionally, teachers participate in professional development workshops in pedagogy and curriculum development, aiding them in the translation of the RET experience into relevant classroom activities, including discovery-based laboratory exercises that are relevant, motivating and standards aligned. Located at Crenshaw High School in the Los Angeles Unified School District and supported by the Integrated Media Systems Engineering Research Center (IMSC ERC), the GameDesk program is a high school program in which high schoolers engage in educational game making in an art-and mathematics-integrated course. 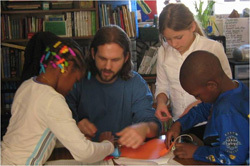 EnCorps Teachers Program helps professionals transition into a second career as a math and science teacher or tutor in underserved public middle and high schools. Services include help earning a California Single Subject Teaching Credential, guest teaching and tutoring.